If you are different from the rest of the world and always do things differently, then try the food at an unusual place. You are not like the rest of the crowd and have always stood out from the rest of the world due to your unusual actions and likings. You deserve different treatment. You like to dress differently, learn differently, and behave differently. You cannot conform to the rules of the society, and do whatever feels right to you. This unusual behavior has appalled people on many occasions, but you do not pay heed to that. Here is a restaurant that does not conform to the normal standard of aesthetic decor. You have a toilet restaurant. This concept is first-of-its-kind in Taiwan. The concept caught fire when an icecream vendor served scoops of icecream in a toilet bowl shaped spoon. This toilet theme caught the fancy of many non-conformists. People of Taiwan are great experimenters. Restaurants with unusual themes exist in the city. Soon a restaurant opened in Taiwan, based on the toilet theme. People welcomed this restaurant with open arms. If you want to savor this experimentation, go to Taiwan and visit the restaurant. The entrance of the restaurant has a picture of the toilet. The lights are faucet shaped, and the seats of the restaurant are shaped like a toilet bowl. Toilet bowls contain the dishes, and the drinks are served in urinal shaped tumblers. The guests can take these urinals home as souvenirs. Squat shaped toilets serve the desserts. Thus, the whole restaurant is turned into a toilet for a whacky feel. The non-conformists love the theme of the restaurant and thus, other places have replicated this theme. Such restaurants exist in China and more recently have opened doors in the US. 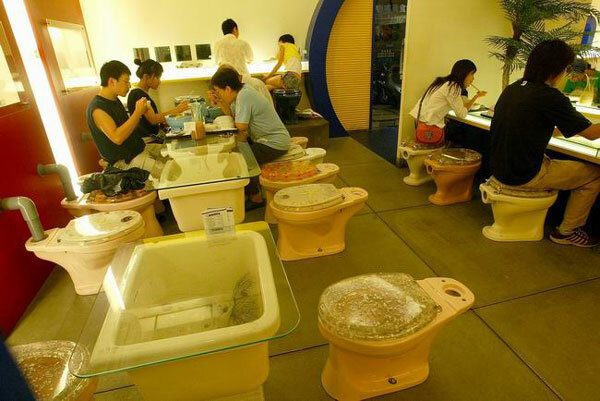 Though the restaurant is themed in an unusual manner, hygiene is strictly followed in such restaurants. The equipments used in cooking are sterilized properly before cooking. The raw food items are washed properly and boiled as required. The toilets are properly sanitized and regularly. The toilets are regularly disinfected. The waiters and waitresses are clean and well-groomed. The restaurant conforms to the same hygiene standards as the others. Therefore, do not worry about the cleanliness of the restaurant. People are quite happy to have this restaurant. Many people love it for the shock value. The décor and the ambience of the restaurants amuse them. The shape of the servers does not put them off. Mostly youngsters haunt this place. Many foreigners and expats also come to the restaurant to get a feel of it. The food is wholesome and tasty. After a hearty meal, people get toilet napkins to wipe off food. People have liked this new concept and have started replicating this concept in other places. The concept proves that nothing is impossible, and you have to keep your mind open to accept new ideas. Open up to a whole new world and new ideas.